Wichita will soon be home to one of the newest trends in outdoor entertainment and the Midwest’s largest inflatable water park. Splash Aqua Park will be a playground on water. It opens in May in the Crossgate District, providing action-packed fun for the entire family. The concept comes from Australia, where Midwest entrepreneur Cole Kalkbrenner helped develop a similar entertainment destination, “Wichita’s unique landscape allows us to create one of the largest parks of its kind right here in the Midwest” Kalkbrenner explains. Slides, wiggle bridges, ramps, jumps, and trampolines are just a few of the many and varied features enclosed within the extensive walkways and floating tracks of the course covering an area the size of a football field. Scheduled to open this May, Splash Aqua Park will accommodate up to 200 people per hour. Kalkbrenner also founded the America’s Cup in 2018, a professional water sports tournament in the Wichita area. Cole and his wife, Erin, have traveled the world teaching watersports prior to settling in Wichita to found Splash Aqua Park. “It’s an easy, fun escape for the day where you test your sure-footedness, scramble up a slippery slide, or create your own jumping contest. Smaller kids have a blast, parents and grandparents enjoy the action, and even the most active teenagers can feel their adrenaline pumping, all in a safe, controlled environment. 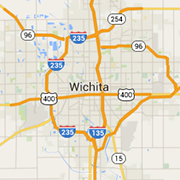 We’re eager to greet the people of Wichita this summer!” says Cole.